Nick Grant was the concertmaster of the San Diego Symphony Orchestra in 2002 when the SDSO received the single largest donation in the history of American symphony orchestras from Joan and Irwin Jacobs, $120 million. He is the only musician in the United States to win auditions for and serve extensively in three different principal positions in a major orchestra in the United States, the San Diego Symphony Orchestra. He was principal second violin for 9 years, associate concertmaster for 10 years and concertmaster for 6 years. To put this achievement in perspective, the list of major orchestras of the U.S. includes the New York Philharmonic, Boston Symphony, Philadelphia Orchestra, Chicago Symphony, Dallas Symphony, Los Angeles Philharmonic, San Francisco Symphony, Minnesota Orchestra, Pittsburgh Symphony, Seattle Symphony, Cleveland Orchestra and about 40 others. Click here to see the notification of his appointment to the concertmaster position. He is also the longest serving string principal in the 105 year history of the SDSO and has won an unprecedented five auditions for different positions in the SDSO. Click here to read Jeremy Kurtz’s fascinating description of the audition process. 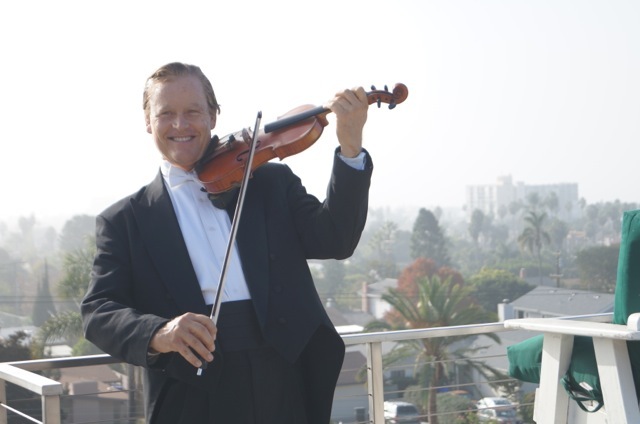 Grant is also the only musician in the history of the SDSO to win advertised auditions in four different decades, and he is also the winner of the first concertmaster audition in the history of the SDSO. It was previously a political appointment without open competition. He has also served intermittently in the concertmaster position of the San Diego Symphony over a period of four decades, decades longer than anyone else in the 105 year history of the SDSO. The San Diego Symphony has recently named him as Principal Associate Concertmaster Emeritus. Nick Grant is a San Diego native, his grandfather having settled here in 1911. He started piano at four years and violin at eight. He grew up in Mission Hills in the house that Kate Sessions built for her brother, Frank Sessions. He attended secondary school with the sons and daughters of three past presidents of the San Diego Symphony Association, Michael Ibs Gonzalez, Philip Klauber and David Porter. Nick’s first performance with the San Diego Symphony was at the age of fifteen playing the Wieniawski Violin Concerto No. 2. At age seventeen, he was one of the youngest musicians ever to audition successfully for the SDSO, entering the first violin section that year. His teachers include John Metzger, Dr. Robert Emile (former concertmaster of the SDSO), and Jascha Brodsky of Curtis Institute. His mentors include Michael Rabin, Leonid Kogan, Josef Gingold, Erick Friedman, Michael Tree, Jaime Laredo, Mischa Schneider, Isidore Cohen and Pinchas Zukerman. Mr. Grant has a Bachelor’s degree from the Curtis Institute in Philadelphia and is the only Curtis graduate in violin to be a member of the San Diego Symphony in the SDSO’s 105 year history. Curtis Institute is renowned for having the lowest acceptance rate of any institution of higher learning in the United States, lower than MIT, Harvard, Yale, Columbia, Cornell, Stanford etc. He is also the first prize winner of the Julia Klumpkey Memorial Competition in San Francisco of which Glenn Dicterow, former concertmaster of the NY Philharmonic, is also a past winner. He additionally won first prize in the Arizona National String Competition adjudicated by the legendary Michael Rabin and first prize in the Musical Merit Foundation in two separate years. Nick has concertized on the east coast in a piano trio with Peter Wiley, cellist of the Guarneri Quartet. He has been a featured soloist for tours of Japan, Europe and the United States and is noted for his performances of the Bach, Ysaye and Paganini violin cycles. 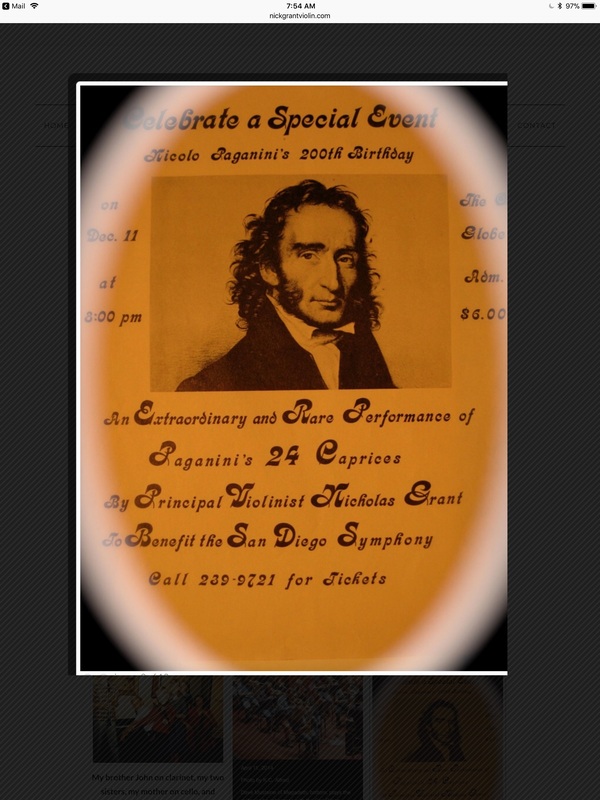 He gave the first and only performance in San Diego history of the Bible of the violin, the iconic 24 caprices by Nicolo Paganini, in the Old Globe Theatre in Balboa Park. Click here for excerpts from that concert. Click here to see the concert flier. He also performed the SDSO premiere and only performance of the encore showpiece “Nel Cor Piu Non Mi Sento” (click here to watch it) and has been a frequent soloist with the SDSO over the years. He has for many years been the only principal of the 17 principal players of the San Diego Symphony to be a native San Diegan. Nick Grant has also conducted the SDSO in Vivaldi’s Four Seasons and the Violin Concerto in A Minor by J.S. Bach. Nick is also a BMI affiliated composer-arranger and has been active in Hollywood for many years as a recording artist on violin. He continues to enjoy volunteering in association with Project Concern International, the Alzheimer’s Association and the Monarch School.